It’s time to kiss those seat back in-flight entertainment systems goodbye. With the BYOD (Bring Your Own Device) trend increasing on the ground, why shouldn’t it in the air as well? Piksel Voyage™ could be an airlines answer to increasing passenger expectations and costs associated with maintaining traditional in-flight entertainment systems. 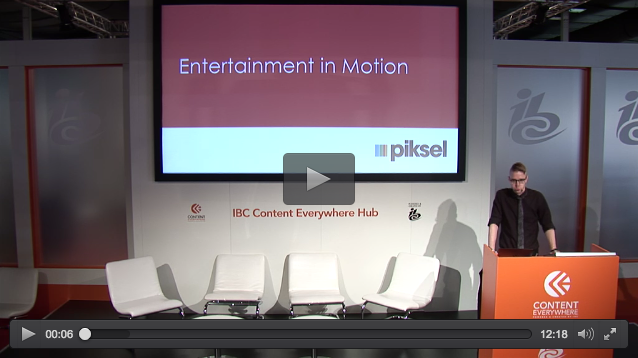 At a session in the Content Everywhere Hub Theatre at IBC 2015, Miles Weaver spoke out about the benefits of Piksel’s new MTVOD (Mass Transit Video-on-Demand) solution, Piksel Voyage, specifically in regard to the airline industry. He explains that in-flight entertainment is the single biggest cost to an airline, yet one of the most expected amenities to a customer. Many passengers already carry their own connected device onboard with research from FlightView reporting that 80% travel with their smartphone, 40% with their laptop, and 37% with their tablet. So why not capitalize on this rather than spend millions of dollars on equipment, installation and fuel to carry it all? Well, we’re here to change all that. Piksel Voyage allows passengers to choose from a wide range of premium TV shows and films and then download that video content straight to their personal devices, prior to boarding a flight. The content is locked until the passenger boards the flight, when it then becomes available to view. Once the flight has ended, the content is automatically deleted from the device, reducing any potential licensing issues. Piksel Voyage also allows data to be captured from the device which then allows airlines and advertisers to target content and ads based on the passenger’s pre and post flight experiences. We call this hyper-personalization and Miles gives the example that if we know a customer is traveling to Orlando, FL, promotions for Disney World or Universal Studios can be displayed. Another advantage of Piksel Voyage, explains Miles, is that this solution is completely future-proof. Airlines will never have to worry about upgrading hardware on the plane, or replacing seat-back screens with better resolutions or larger screen sizes. The customer’s devices have already have surpassed current systems, and will continue to. Not to mention the comfort and personalization that personal device brings them. Transavia, a low-cost carrier operated by KLM, was the first to hop on board the future of in-flight entertainment with Piksel Voyage. Will you be next?